Prominent & Leading Manufacturer from Surat, we offer gear oil pump and oil pump. GEAR OIL TRANSFER PUMP Useful for pumping and transfer of all viscous liquids, oils and petroleum products AKSHAT ENTERPRISE offers Helical Gear Pump, FT Series. It is available in cast iron grade with single helical alloy steel gears and hardened and ground shafts. It has sturdy design and construction to give long and trouble free life and performance. Ultra bronze bush material ensures smoother running than conventional phosphorous bronze. It is available in sizes 1/2" to 3", capacity range of 20 to 500 LPM and can operate up to a max pressure of 10 kg/cm2 and temperature up to 80C. 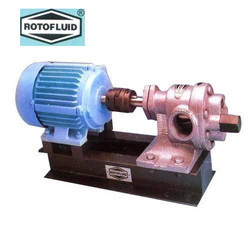 “ROTOFLUID ” as well as " ROTODEL" brand gear pump Models which is self priming, foot mounting type positive displacement rotary gear pump. 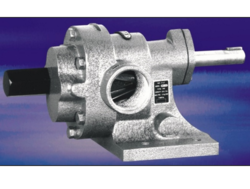 Cast Iron construction which is single helical modified profile carton steel gear shrink fitted on alloy steel hardened and grind finished shaft as gear firmly supported 4 nos. of self lubricated sintered bronze bush bearing which ensure smooth running. These pumps can be run in either direction with change in inlet-outlet port position. The relief valve operations can be reversed by simply changing the R.V. parts on opposite side. Gear Oil Pump useful for pumping and transfer of all viscous liquids, oils and petroleum. It is available in cast iron grade with single helical alloy steel gears and hardened and ground shafts. It has sturdy design and construction to give long and trouble free life and performance.